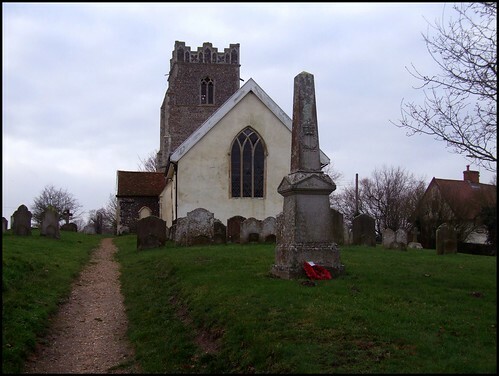 With one of the best of all Suffolk's smaller churches, Cretingham is a pleasant, self-contained sort of place, set in the lonely lanes between Debenham and Framlingham. This part of Suffolk rolls gently, fields dipping into valleys, fine old houses appearing through copses of trees. Added to this, Cretingham has an excellent pub, the Bell. It is pleasant to wander through the lanes that connect Cretingham with neighbours Framsden, Brandeston and Kettleburgh and end up at the Bell afterwards. The church has a fine setting, and you approach it from the east. 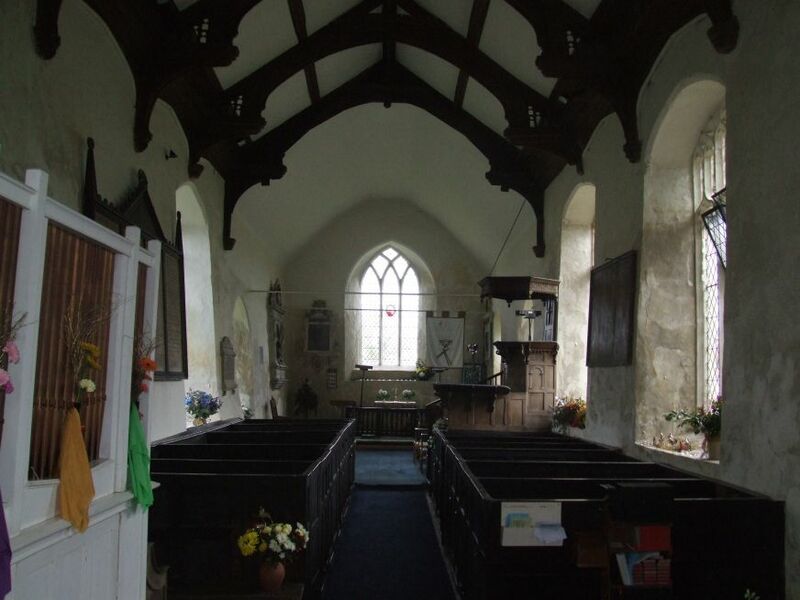 It looks lovely, its ice cream walls punctuated by Perpendicular windows in the nave, and Early English in the chancel. If it wasn't for the tower and the graveyard, you might even think it was a cottage. 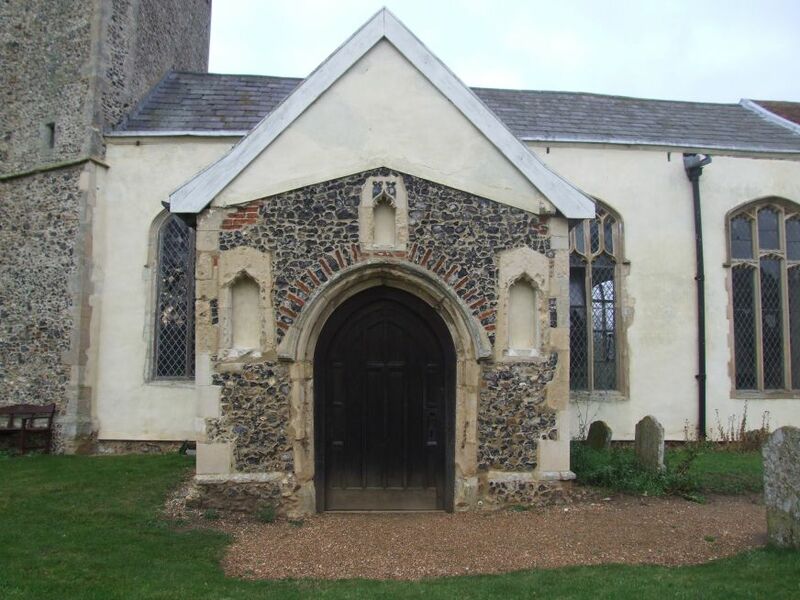 There are three large niches around the entrance of the 14th century porch. Probably, they once contained a rood group. The porch leads into a lovely, rustic interior, thoroughly rural and ancient. 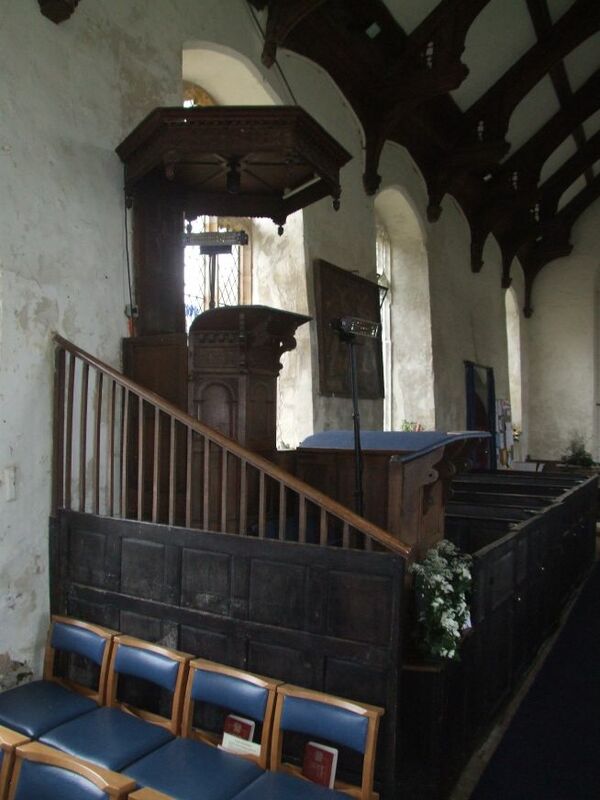 There was a very restrained 19th century restoration, and the overwhelming impression is of at least a century earlier, the range of box pews leading the eye to the double-decker pulpit. 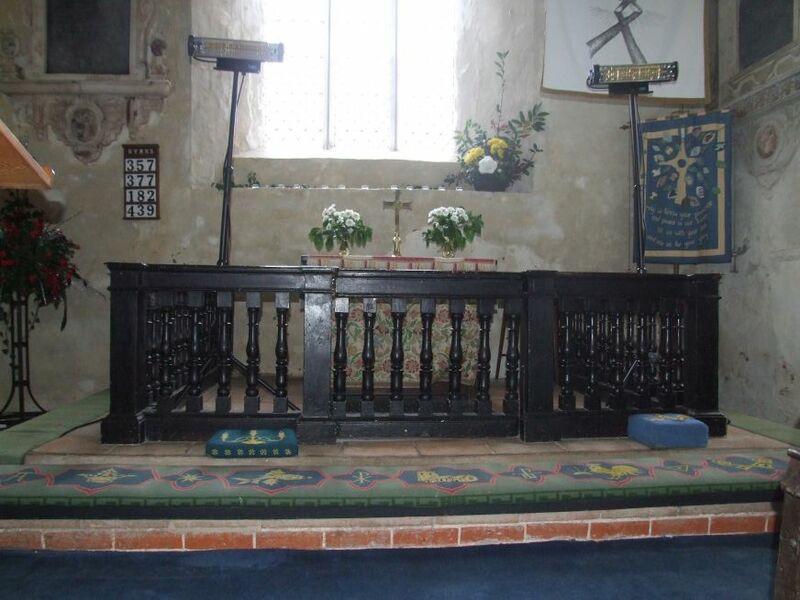 There are some older benches at the west end of the nave, elegantly carved with typical 15th century motifs. 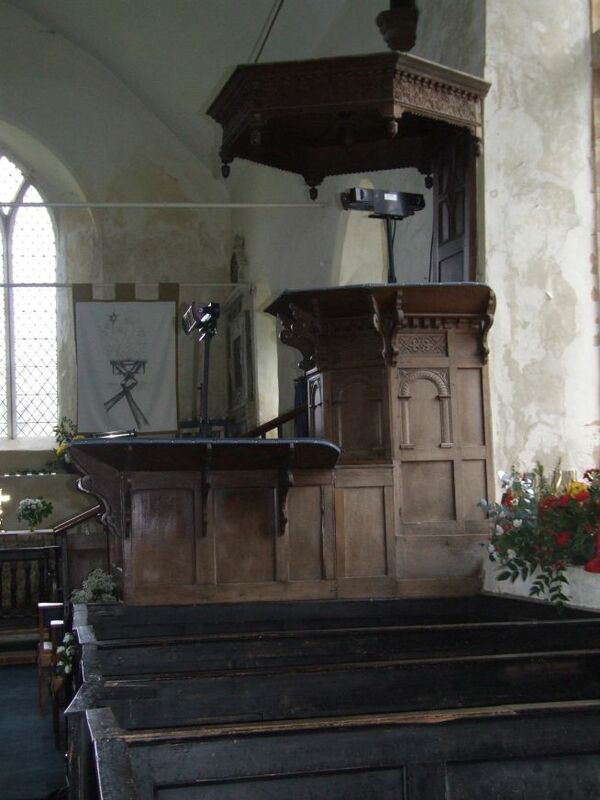 There is a good set of three-sided communion rails, generally an unusual survival in East Anglia, although there are several sets around here. Also striking is the is the paint on the font; at one time, perhaps all were so, and traces survive in Suffolk on others, most notably Westhall. It is is entirely possible that the paintwork is not a medieval survival, but dates from the 18th century, when there was a fashion for painting old stonework; but I liked it all the better for that possibility, one of those threads of continuity that make our parish churches testaments to the buffeting of history. There is a good Charles II coat of arms; nothing remarkable about that, but when it was restored a few years ago it was found to have a set of the Ten Commandments on the back. Now, this almost certainly means that the arms are a repainted version of Charles I, and that the board was simply reversed during the Commonwealth, in a rare act of puritan pragmatism. In preparation for the restoration of the monarchy, the lower part was repainted, replacing James I's motto of Exurgat Deus, Inimici Dissipentur ('Rise up o God and Scatter my Enemies', my favourite Latin tag and one that I mutter under my breadth several times in the average working day) with God Save the King and the figures of Arts and Agriculture. In an earlier, but no more gentle age, Lionel Louth died and was commemorated on the north wall of the chancel. His 16th century effigy kneels, but has lost its legs, a curious sight. In a window opposite is a good piece of late medieval heraldic glass, but otherwise the windows are clear, filling the building with a lovely creamy light. In the late afternoon gloom I watched the dust falling gently through the air, as if time itself was settling here.